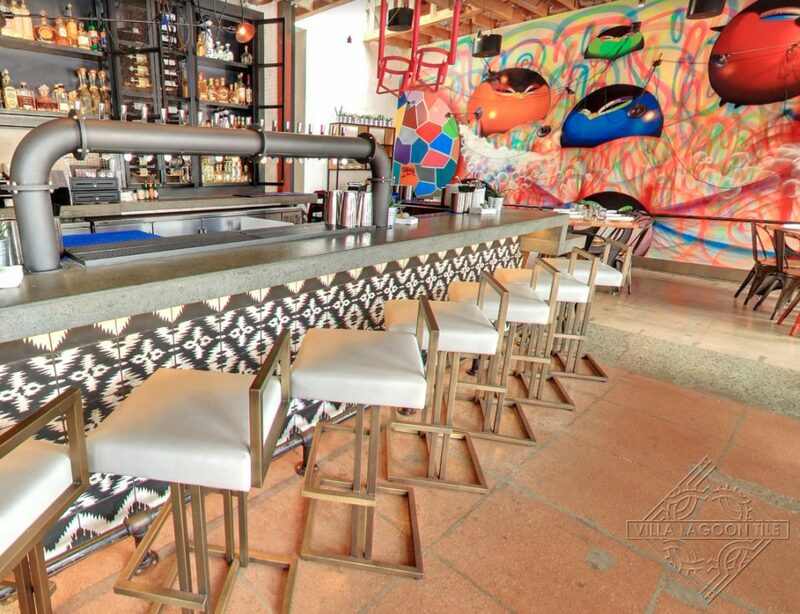 While we are lovers of vivid colored walls, not everyone is, especially in the USA. 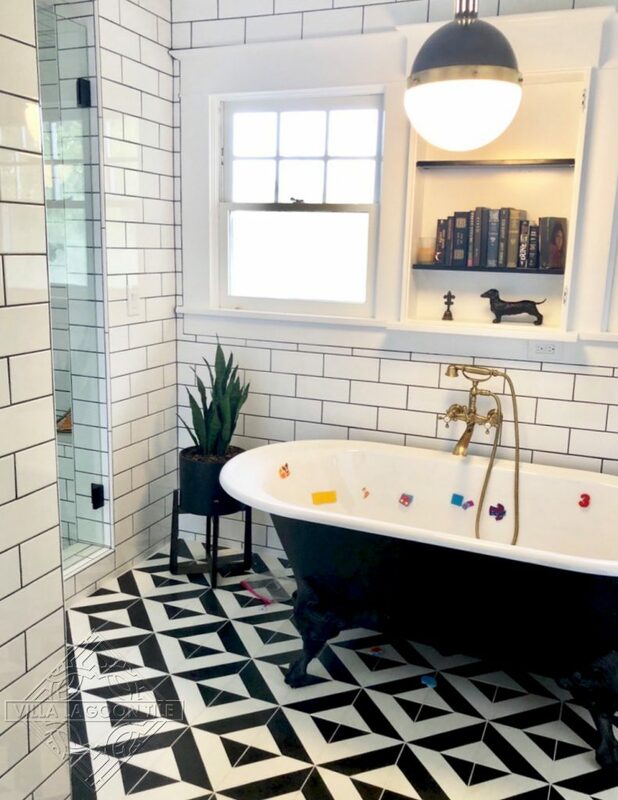 But a white bathroom need not be boring if the floor is singing a happy tune. 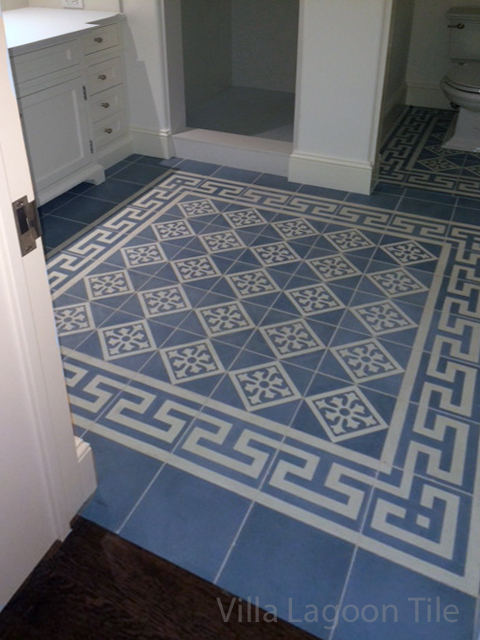 The pattern above is one we call “Ambrose” and our client ordered it in a crisp blue and white. 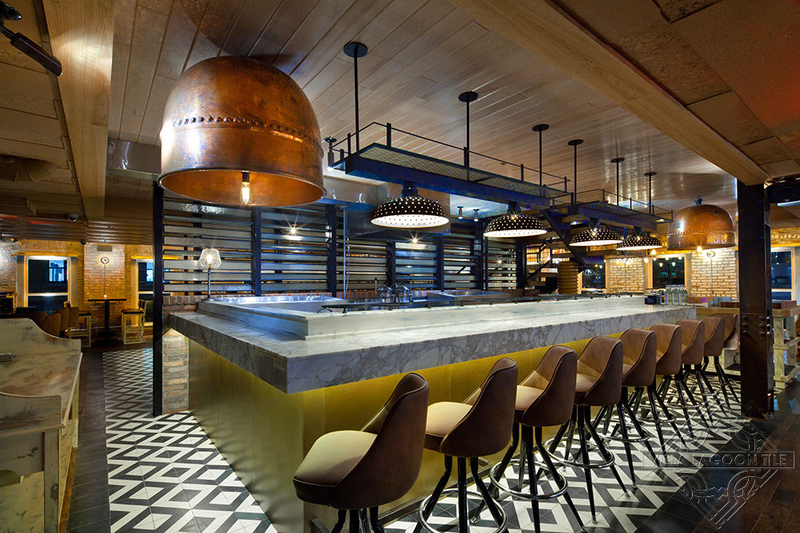 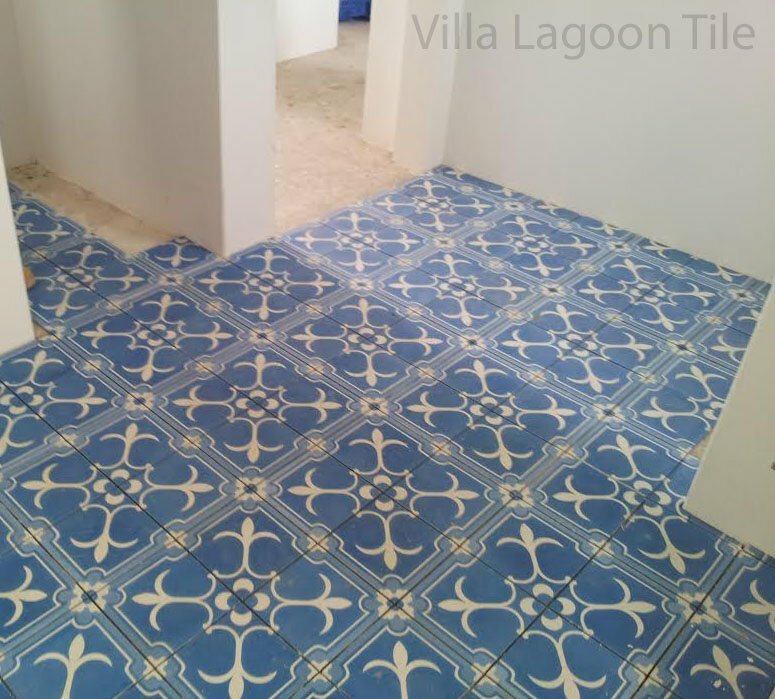 Below is a custom tile called Italian Trellis “Azul” from our Coastal Collection. 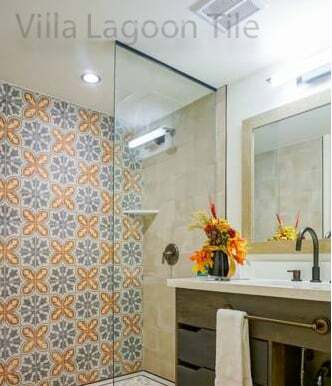 You can click for a larger image to see the details of the seashells and coral. 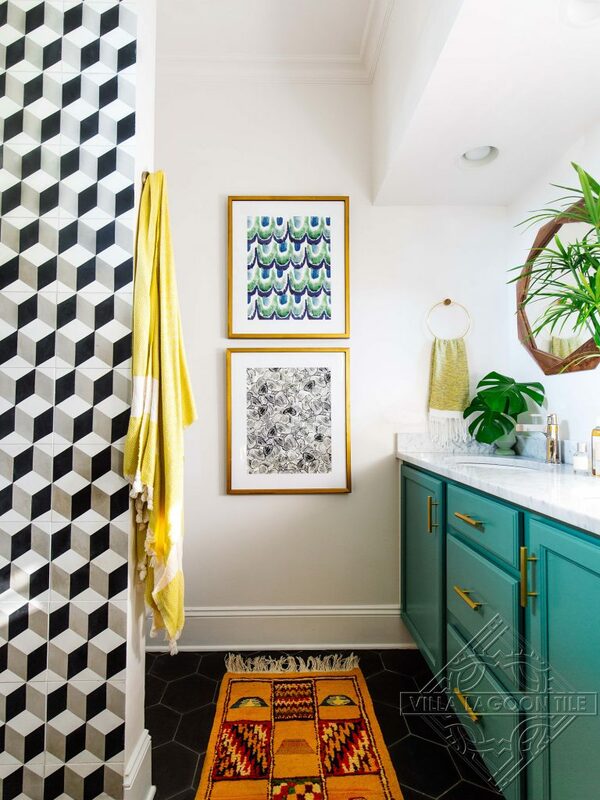 The soft blues and white walls give the effect of shimmering water on a bright day. 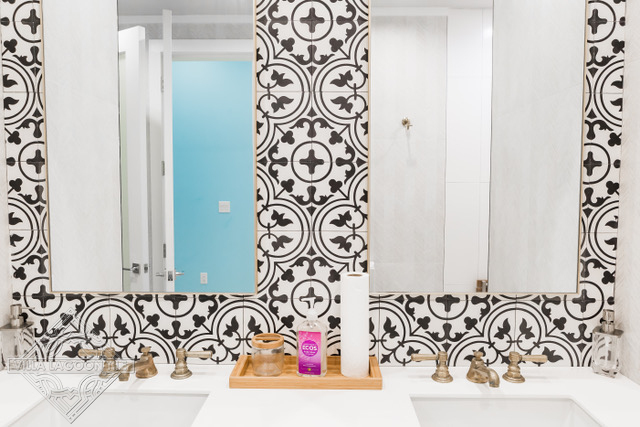 One of our classic favorites above, Surf “Agua” with white subway tile walls in this bathroom. 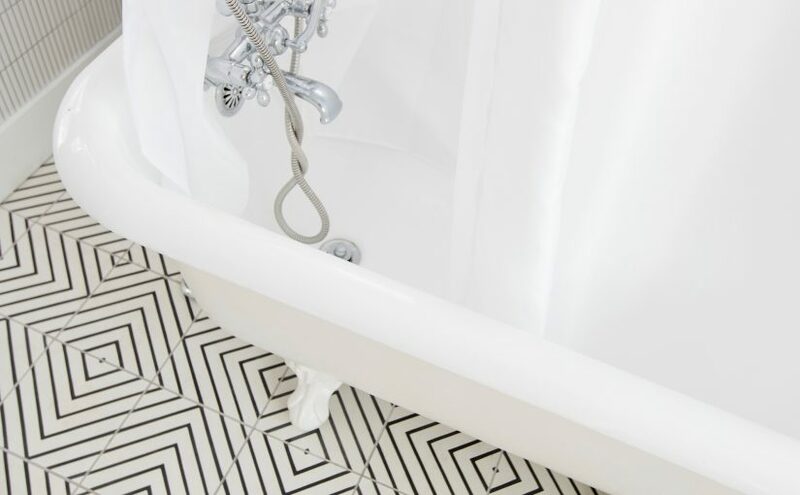 A great pattern with movement…jazzy and fun. 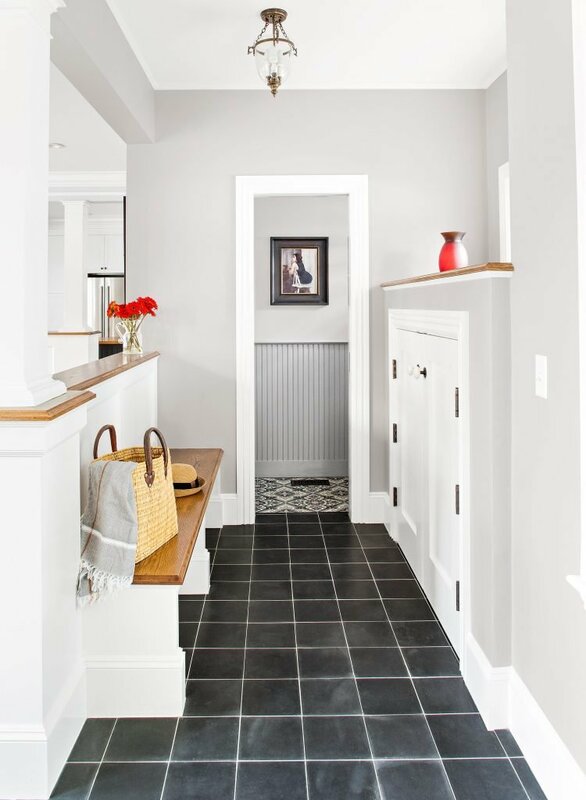 Click to see the full size image. 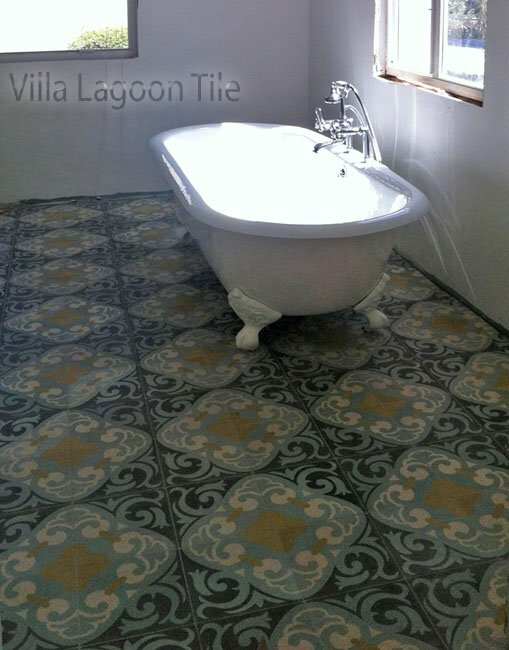 A client with a home in the Bahamas chose 2 tiles for the bathrooms. 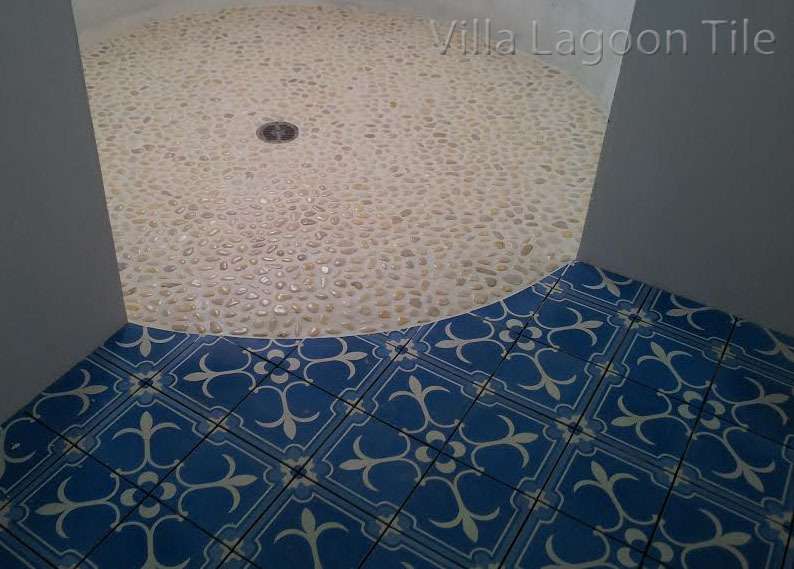 (Note: construction photo) This one has a round shower area shown below. 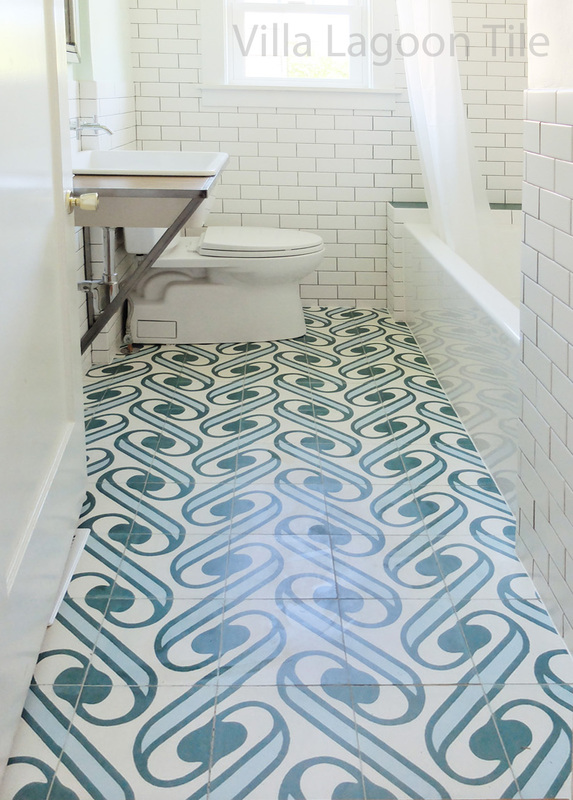 If you think there is a trend of blue cement tile bathroom floors, you are right. 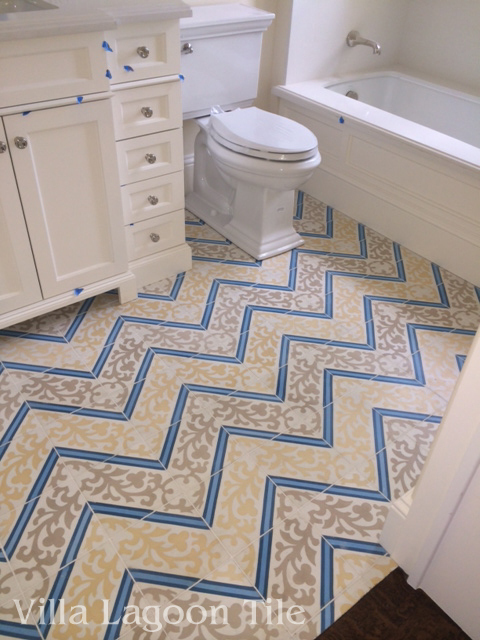 This pattern is called “Liz” and it is made with two shades of blue plus white. 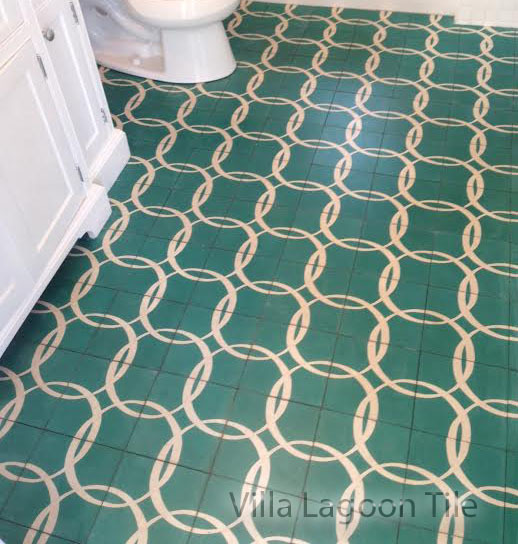 Our delightful client, jewelry designer Trish Becker, used a 2 color Aqua and Blanc pattern tile of interlocking rings in one of her homes in the Bahamas. 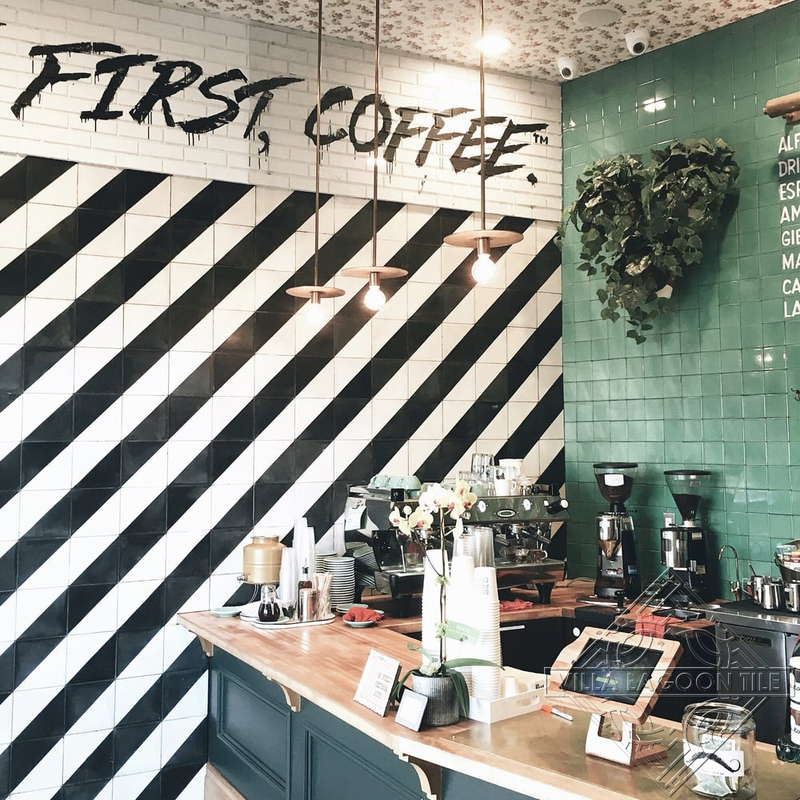 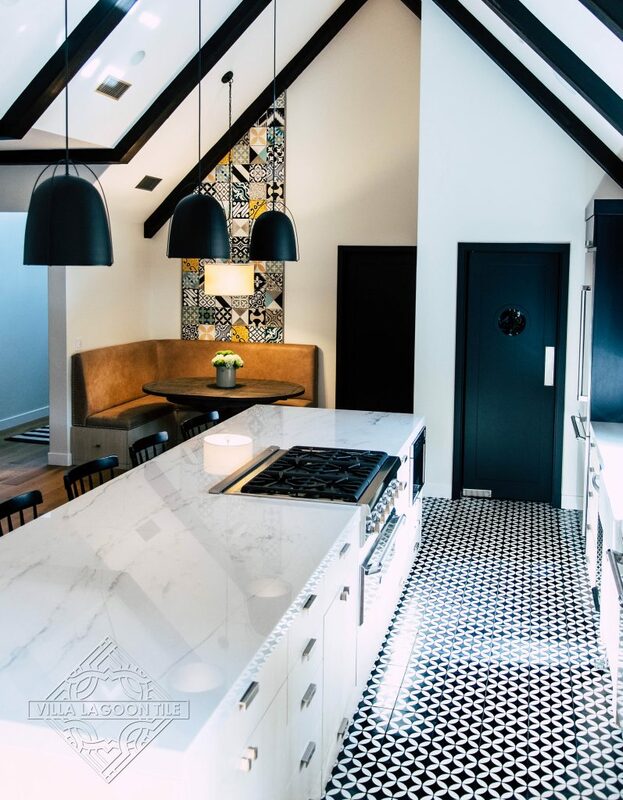 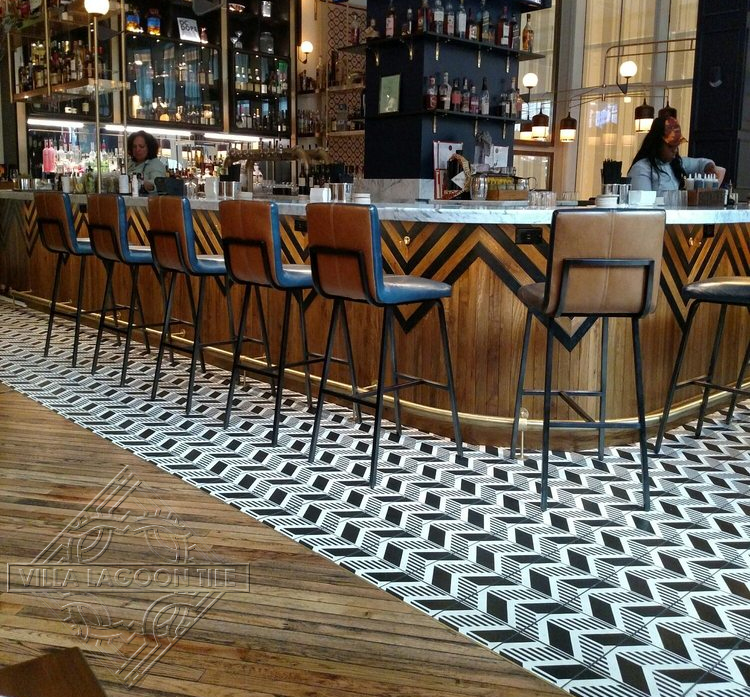 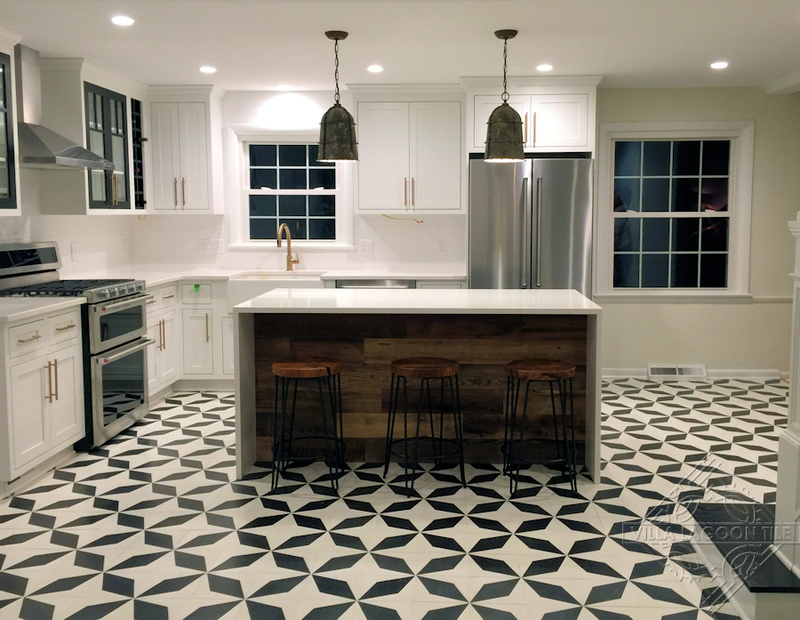 Trish is ‘hooked’ on cement tile and knows how much character it adds to any room it is installed in. 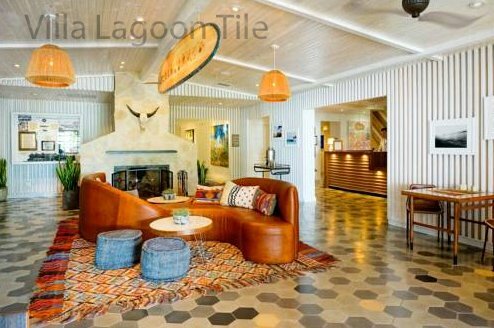 She has a couple of vacation homes and she knows that when people rent a cottage for a beach vacation they appreciate decor which makes the stay really special. 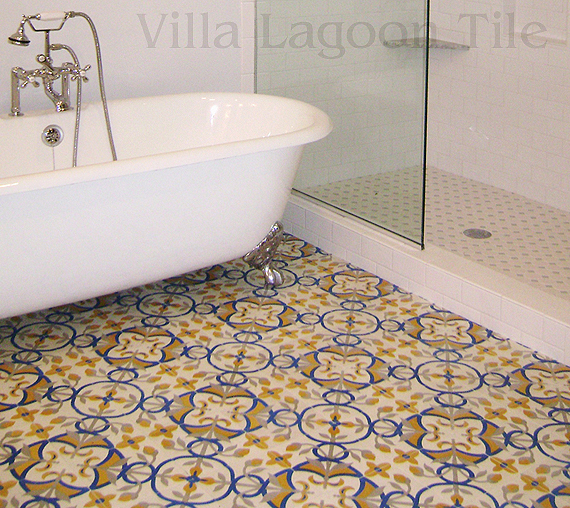 Still a bit of blue in this delightful floral cement tile but also the warm golds above and below. 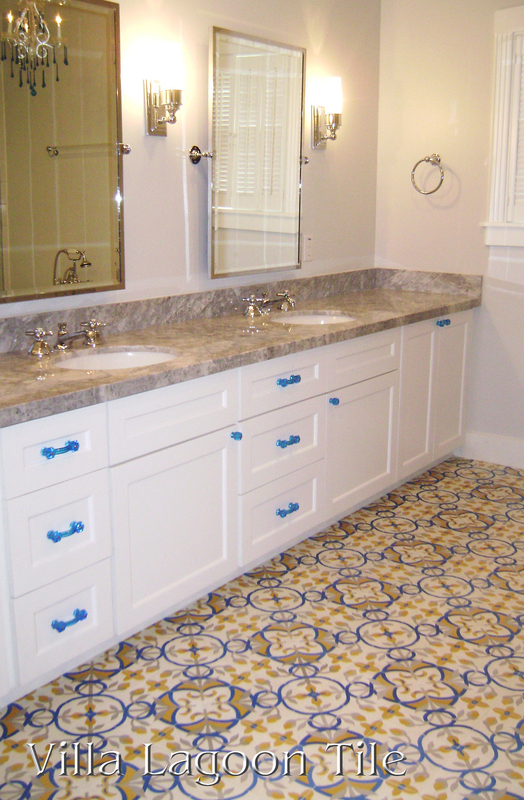 The owner added bright blue glass drawer knobs which was such a great idea. 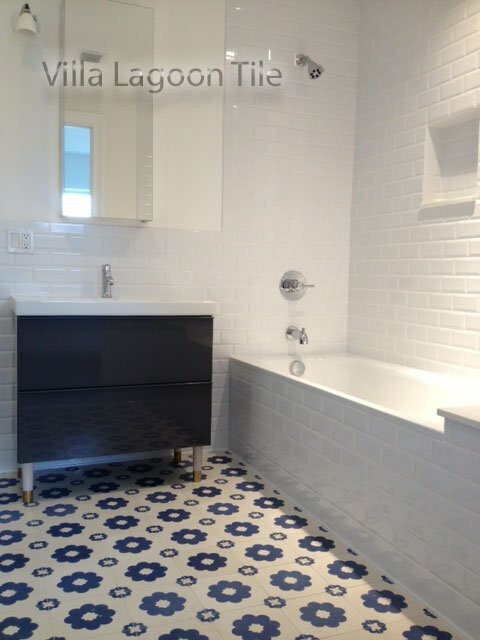 In the above photo the cement tile bathroom floor appears a bit blue in this photo but it may have been a shade of gray with the white. 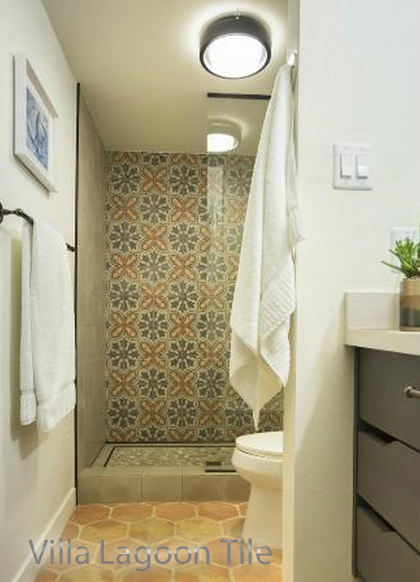 On the upper right you can catch a glimpse of the rug effect repeated around the toilet in an alcove. 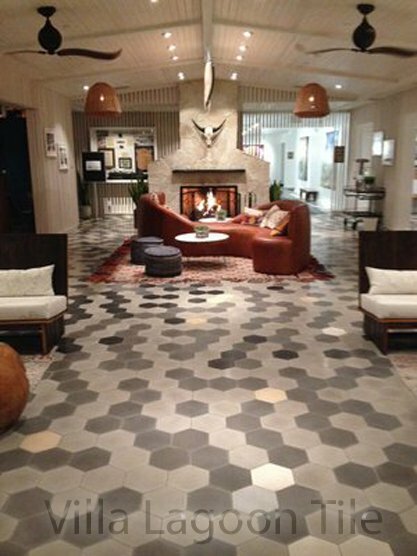 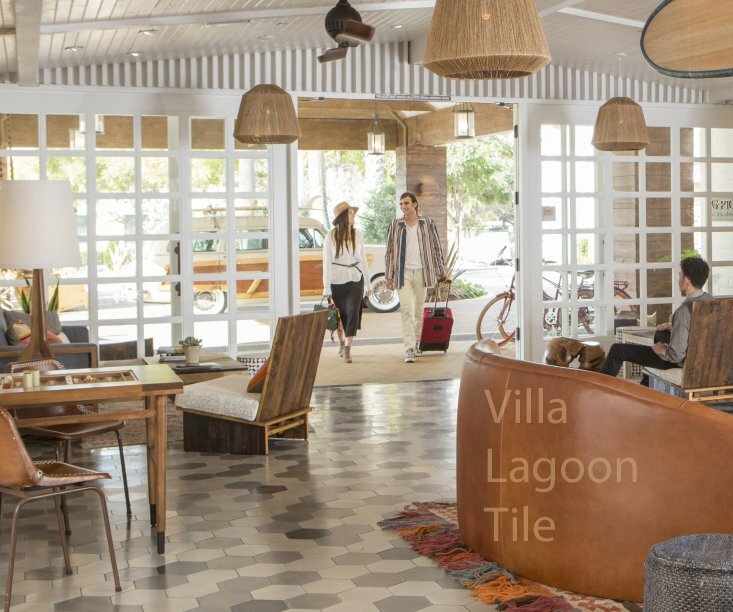 Using cement tile to create rug or bordered carpet effect is an old tradition. 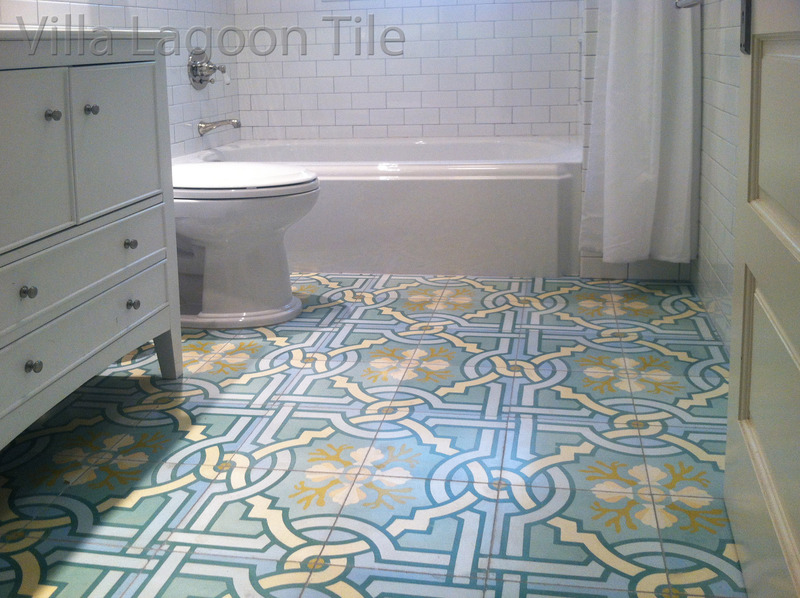 Yet another all white bathroom (above) , this time with a Cuban Heritage Tile floor, CH-260-2B. 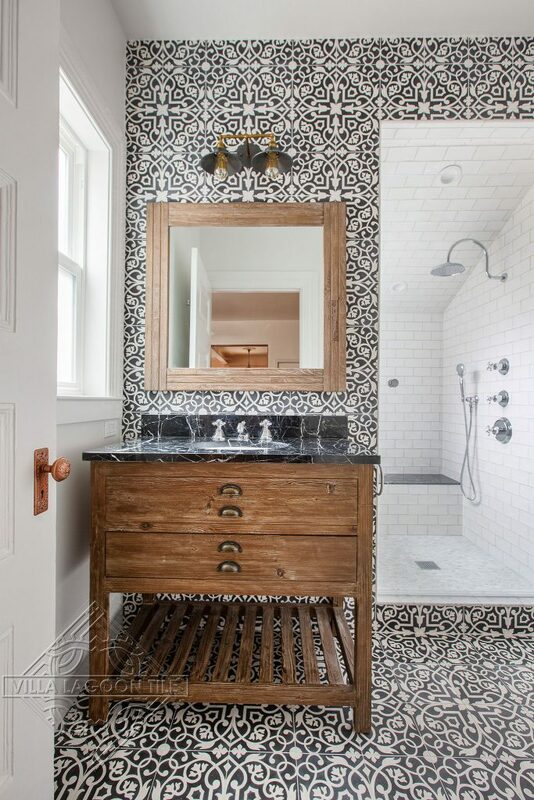 This last photo is our popular LaEspanola cement tile in an otherwise white bathroom. 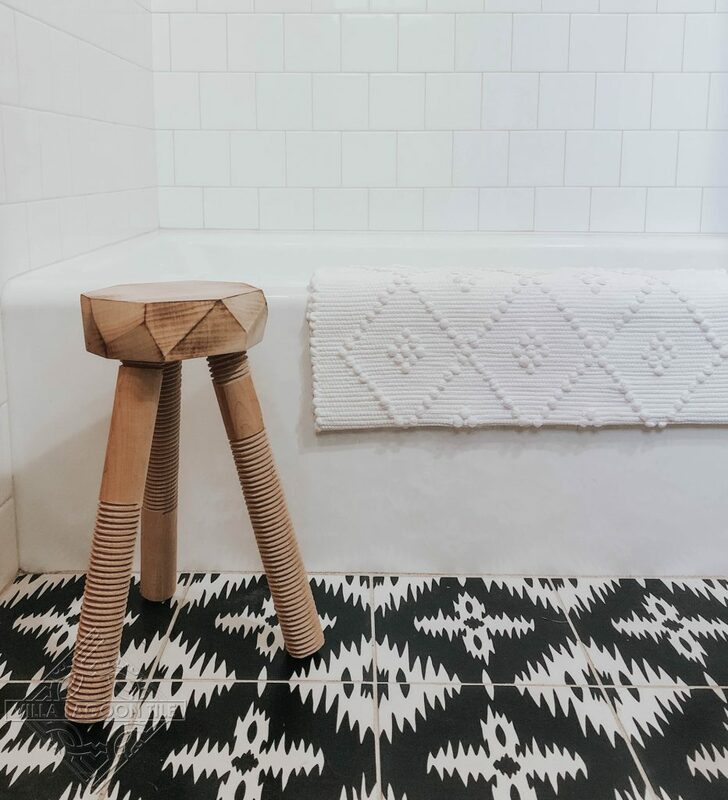 Even though this is a photo taken during construction, the combination of a clawfoot tub and our cement tile with classic Spanish scroll-work looks like it could be a bathroom in Barcelona as easily as in Florida. 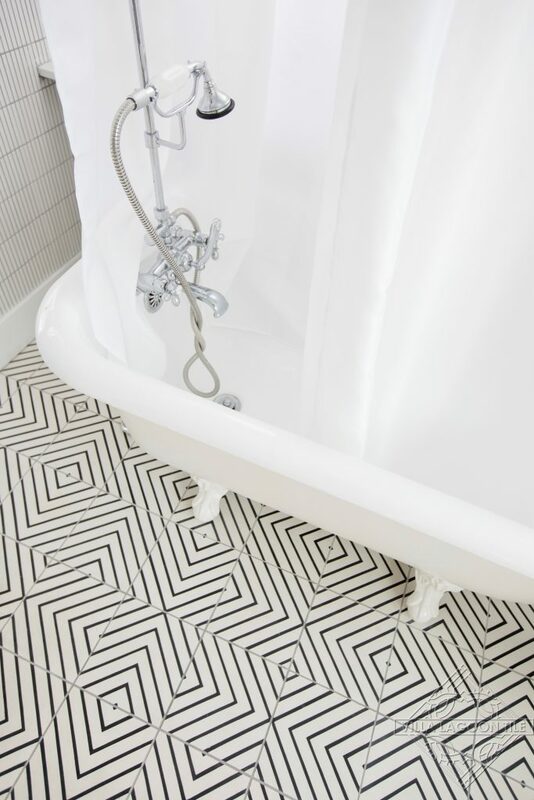 A lively cement tile floor to accent your all-white bathroom can “bring it up a notch” on the cool scale. 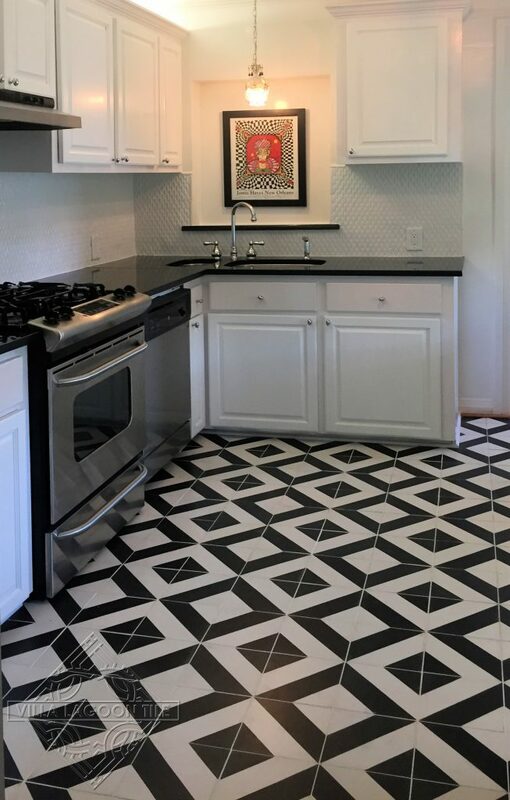 Click here to see this tile in an all white kitchen.